Paterson Grain, LLC has a reputation for being a good corporate citizen, making meaningful contributions in the communities where we operate. We are strong supporters of community events and pride ourselves on the contributions we make towards local community development. 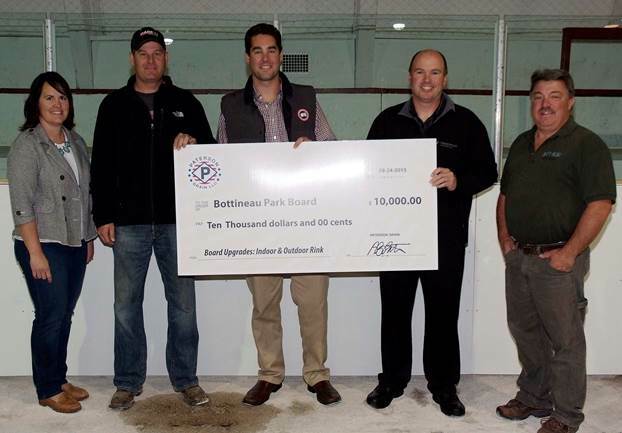 In September 2015, Paterson donated new dasher boards to the Bottineau Arena’s indoor rink and installed the existing boards on the outdoor rink. From left to right: Rachel Patterson, Riley Getzlaf, Shane Paterson, Mike Aasen and Brian Knudson.